The pilot phase of M Partner will address priority projects centered around community health and well-being, economic development, educational initiatives and beautification. All these projects have potential to create partnerships that lead to transformational collaborations between community members and UM faculty, staff and students. M Partner was designed using a national model, the Educational Partnerships for Innovation in Communities Network. The initiative aligns university talent with community-driven projects to create tangible results in partner communities. The university and the partner communities have committed to a pilot phase of 18 to 24 months in Charleston, Lexington and New Albany. After its launch in March 2018, M Partner convened stakeholder meetings with community leaders in Charleston, Lexington and New Albany to identify each community’s strengths, opportunities and aspirations. “In the needs assessment phase of M Partner, we spoke with many individuals who are working tirelessly to create pathways to opportunity and economic mobility,” said Albert Nylander, professor of sociology and director of the university’s McLean Institute for Public Service and Community Engagement. These community meetings produced a list of 27 priority projects and structured how the university as a whole can advance community and economic development in these three rural Mississippi communities. “In the first year of M Partner implementation, we sought to generate momentum by aligning with other initiatives housed at the McLean Institute,” said Laura Martin, M Partner director and associate director of the McLean Institute. In August and October, M Partner hosted business forum webinars in each community with support from the Entrepreneur Center at the Mississippi Development Authority; these events engaged 115 participants from UM and partner communities. 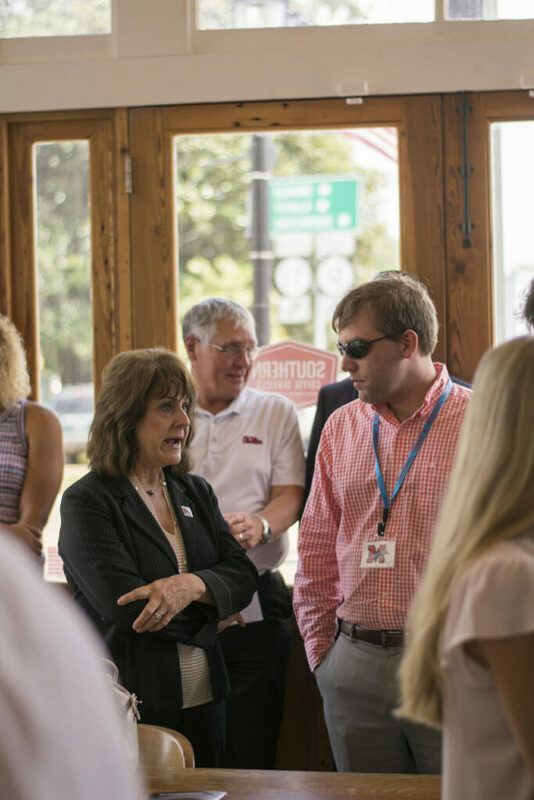 These events highlighted seven locally owned businesses and one nonprofit organization while providing networking opportunities among Ole Miss students, faculty, staff and community partners. M Partner also has created opportunities for students to participate in Days of Service in partner communities. “The success of these Days of Service is due to our incredible campus and community volunteers – nearly 200 of them,” said Michaela Cooper, an M Partner VISTA who has worked to organize days of service in each partner community. “M Partner Days of Service have provided students the opportunity to carry community service beyond campus to appreciate the opportunities for economic growth in Charleston, Lexington and New Albany. During the spring 2019 semester, faculty and staff have taken on 15 of the community-identified projects. These priority projects will address community interests such as social media campaigns, health fairs, addressing the opioid epidemic, grant writing, research around the third-grade reading gate, expanding local farmers markets, and analysis of parks and recreation infrastructure. In Charleston, faculty and students are working on projects related to social media campaigns, health promotion, awareness of health professions, training and support for first responders on opioid use, researching opportunities to expand telemedicine, and exploring best practices for implementing wellness policies such as complete streets. The projects in Charleston involve faculty and students from the university’s integrated marketing communications, public policy and sociology majors, as well as pharmacy practice at the UM Medical Center. “I’m seeing more faculty get involved and being encouraged to do so, where that hasn’t always been the case,” said Anne Cafer, an assistant professor of sociology who teaches a Community Development class that is partnering with Charleston this semester. “I also think community members are genuinely interested in engaging students and being a part of the educational process, while simultaneously getting help with work near and dear to their heart. In Lexington, Ole Miss representatives are tackling projects that address community health and literacy goals. For the M Partner projects in Lexington, the Department of Health, Exercise Science and Recreation Management and the Office of Health Promotion will be joining community efforts to establish a health fair for Lexington’s Spring Festival and completing the 2019 Healthy Hometown application. The Center for Excellence in Literacy Instruction is working with the school district to promote reading proficiency by the third grade. “To ensure that all students read and write at proficient levels, we know that effective literacy instruction is critical,” said Angela Rutherford, professor of teacher education and director of CELI. “The CELI is partnering with the Holmes County Consolidated School District within M Partner to develop a coherent and cohesive literacy framework that teachers and administrators will use to provide instruction across all grade levels. In New Albany, courses affiliated with M Partner are advancing projects that enhance the infrastructure around community health and well-being. The university’s Sally McDonnell Barksdale Honors College is working with community members to study best practices in expanding the farmers market, while students from the health, exercise science and recreation management program will assess opportunities for growth and development of the New Albany parks and recreation system. The M Partner pilot phase lasts until June 2020. For the duration of the pilot phase, M Partner will continue to establish and deepen collaborations with community partners to advance the shared goal of co-creating knowledge and resources to promote community well-being. In reflecting on the progress of the initiative since its official launch in March 2018, Caldwell noted that, “Laura Martin, who serves as M Partner director and associate director of the McLean Institute, has worked hard alongside others at the McLean Institute to ensure that this initiative has enjoyed the progress and success that it has to this point. For more information about the M Partner program, visit http://mpartner.olemiss.edu.